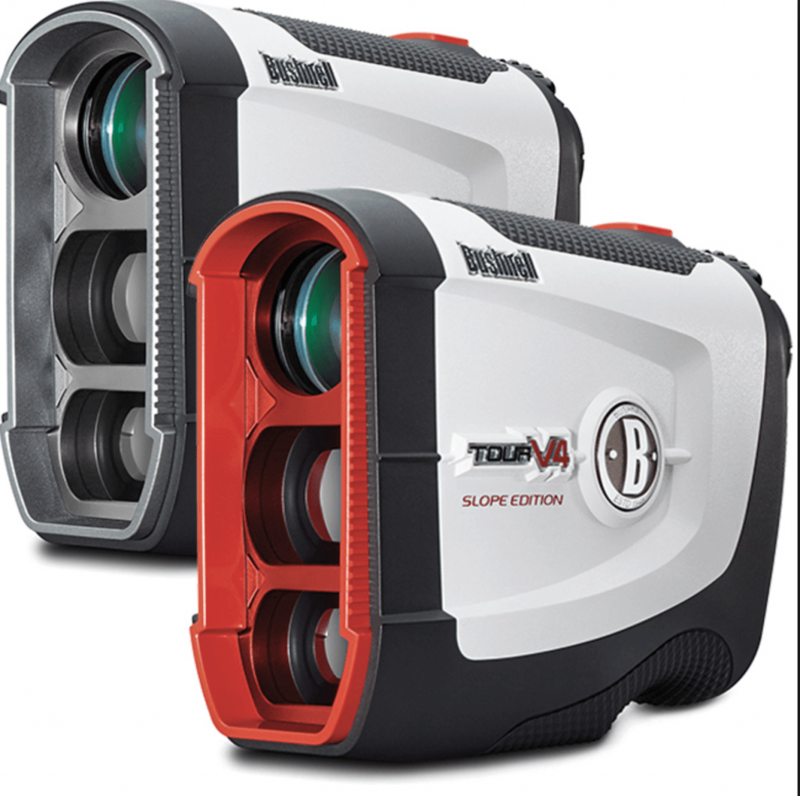 The Bushnell Tour v4 Slope Rangefinder is another excellent addition to the Bushnell family of laser rangefinders. If you read my review of the Bushnell Tour X Jolt, you’ll know I gave it very high marks and a full recommendation. Still do. The v4 performs as expertly as the Jolt, but in a much more economical package- both size and price. While, you nor I should ever actually complain about the Tour X, compared to the v4 it’s a bit clunky and doesn’t easily fit into your pocket- not that I would care to put it there- but some people may. The v4 Slope does fit more nicely in the palm of the average male and offers a “grippy” rubber pad on top for extra stability. The dial to adjust your focus on the v4 Slope is now a little harder to turn, which turns out to be an advantage. It doesn’t change your settings in between shots as easily just from common handling. 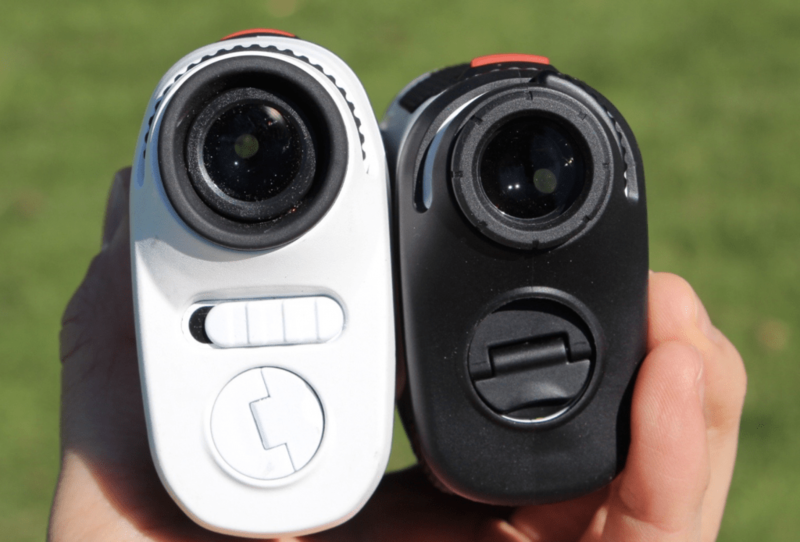 Unlike the Bushnell Tour X Jolt, the v4 comes in two versions- one with slope (V4 Slope, and one without slope (V4). The V4 Slope comes with a red front and the V4 has a gray front. The V4 Slope is about $70 to $130 more the the V4 depending on which retailer you go with. Disabling the slope measurement on the V4 Slope is accomplished clicking and holding the red power button located on top of the device. The Tour X 360 required you to switch out faceplates for this purpose. Again- we ain’t going to complain about the awesome Tour X, but this is a lot more convenient and lessens the chance of losing an expensive piece of the device. Operation is much like the Jolt- pick out your target with the crosshairs and push the conveniently located power button on top of the V4. The yardage will be displayed as will the adjusted yardage or meters along with the slope if the slope feature is activated. 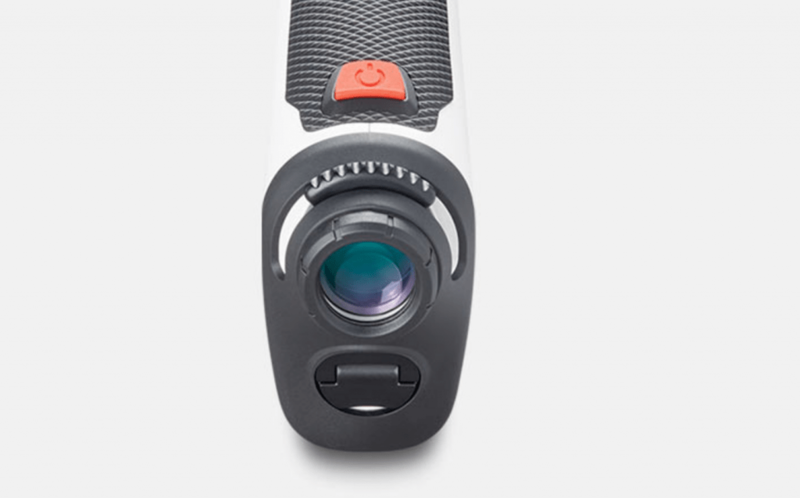 To let you know that you have hit the flag, the Tour v4 will vibrate when you are locked on. The success of getting a ‘jolt’ may vary with how much the flag is moving and the distance to it, but even if there is no vibration you can still get the distance to the flag. The “Jolt” technology lets you know you’ve locked onto the flag, but the distance will show up whether or not the jolt happens. Depending on how much the wind moves the flag and the distance to the flag, you may experience some difficulty locking onto your target. Needless to say, the farther away you are from the flag, the more stable you will have to be with your aiming and holding the V4. Any movement will be magnified and make getting the distance that much harder. 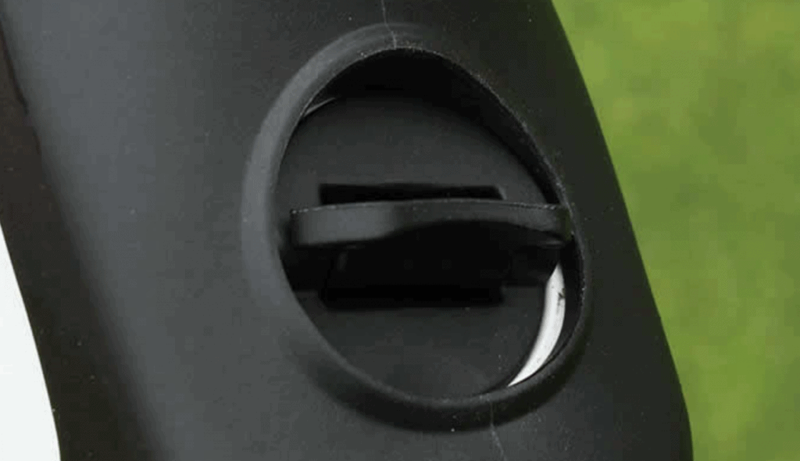 Pictured below is the Tour V4 pop-up tab which easily unscrews to give you easy access to the battery compartment. The premium carrying case from Bushnell is a winner too. It comes with a convenient D-ring to easily hang from your bag. There’s an extra level of convenience built into the carrying case. 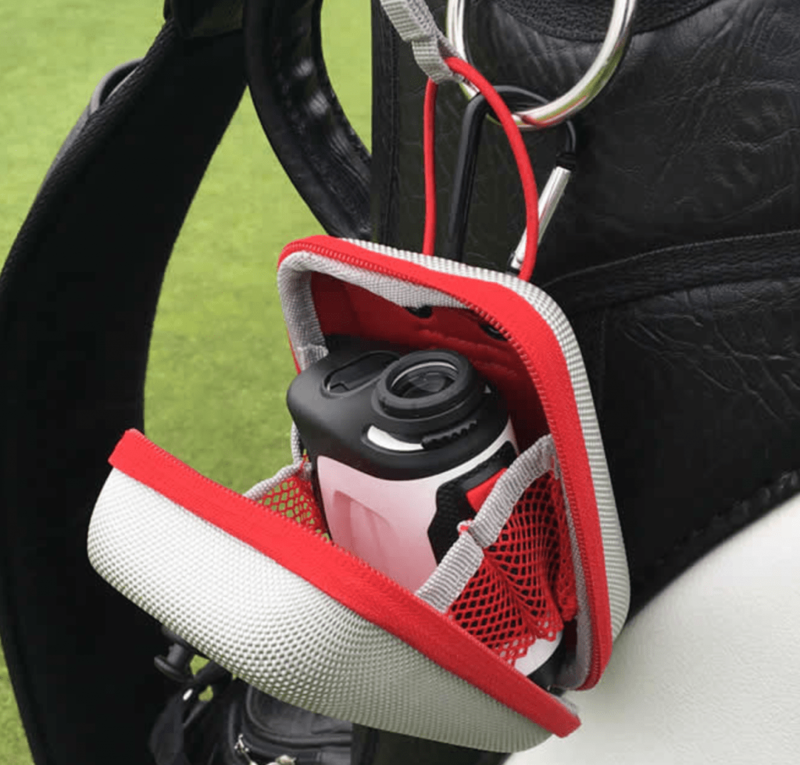 You don’t have to zip it up during the round while it’s in use. On the back is a strap that can go over the top of the case and hook onto a button or peg located on the front to securely close it. 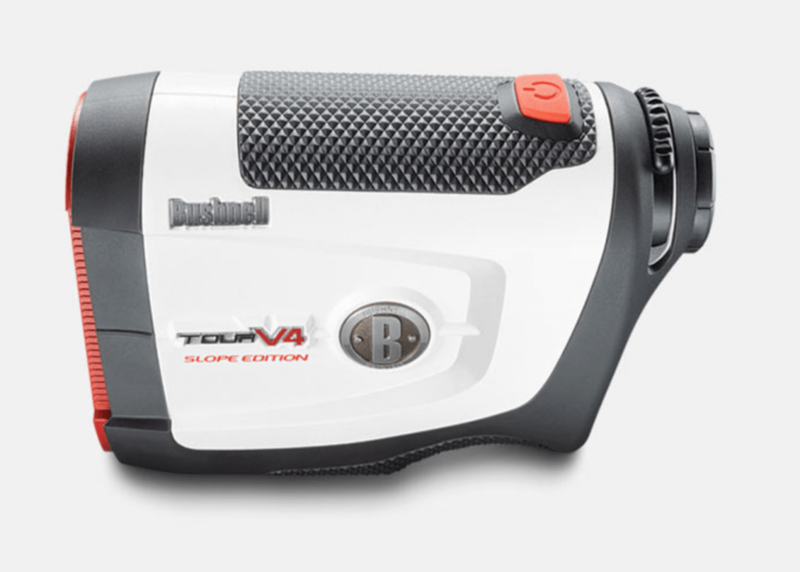 We think the Bushnell Tour V4 is a stellar choice and if you are in the market for a top notch range finder, we really don’t see how you can go wrong with the V4. Either the regular Tour V4 or the Tour V4 Slope with more than serve your purpose. If you’re more in the market for a GPS and game intelligence device, check out our review of the Arccos 360 Gift Box Bundle GPS Stat Tracking System. If that’s a little too much to chew on and you want to test out the company and technology, then take a look at our Arccos Driver Tracking System. Same technology, but with only one sensor for your driver.